One of the stranger things I've seen in my years as a birder/consultant - a Horned Lark hanging dead from a hydro wire. It was there for multiple weeks - hanging the same way... I would guess that a predator brought it there, and it somehow got stuck (or froze?) there... Pretty odd... Any ideas? 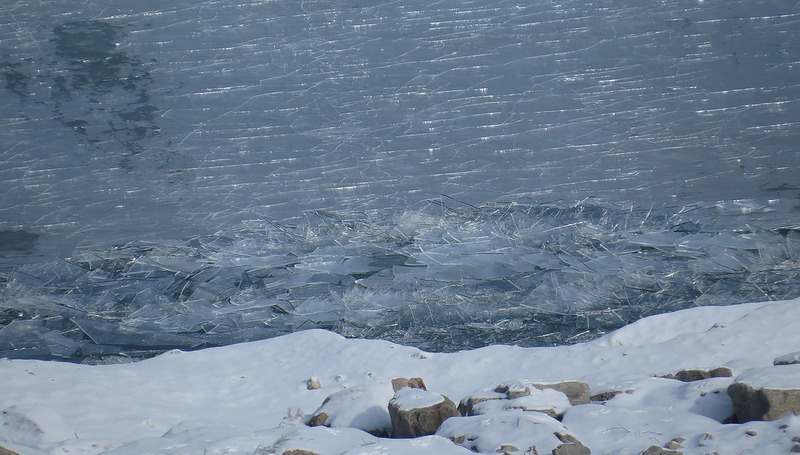 Ice on Feb 24th (above) - the big winds of our last storm did a decent job of hacking some holes in the Great Lakes Ice cover. We have some freezing cold temps lined up for the next 10+ days - but every day has also been associated with a lot of strong winds - which don't bode well for ice formation on Lakes Michigan and Ontario.... 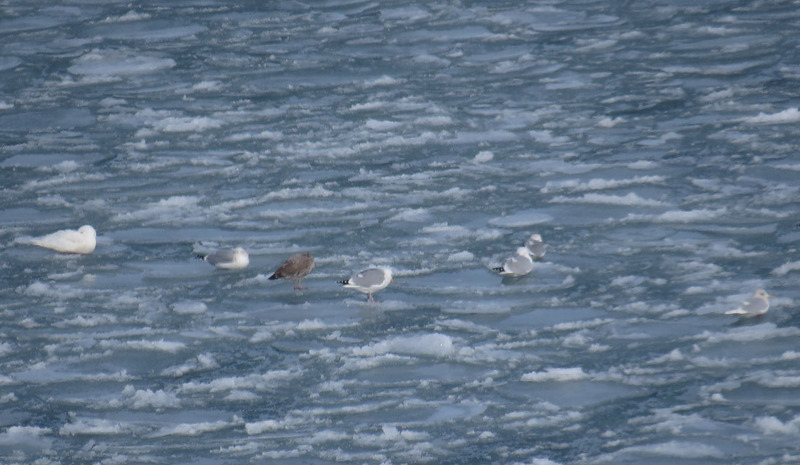 The other three have so much ice cover though, that they could all freeze up again. 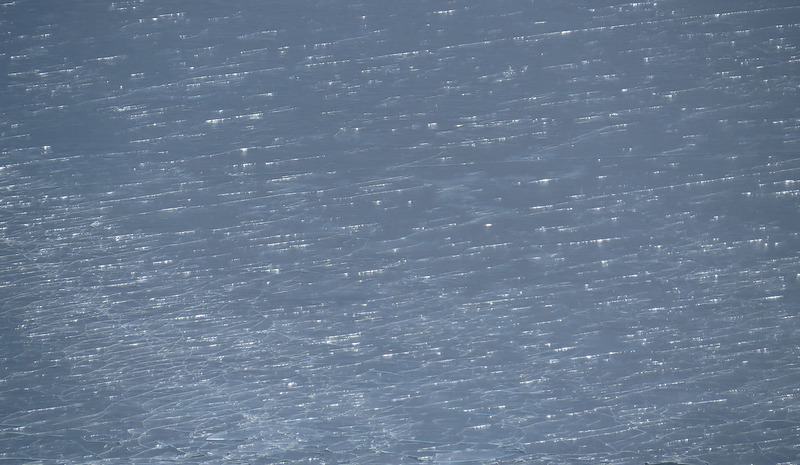 The strong winds of the last storm pushed a bunch of ice NE on Lake Erie - giving cause for the first designation of "very thick ice" so far in 2014... Not only that, but it seems to be covering at least half of the Lake! These guys seem to be taking a beating at the hands of this poor weather. 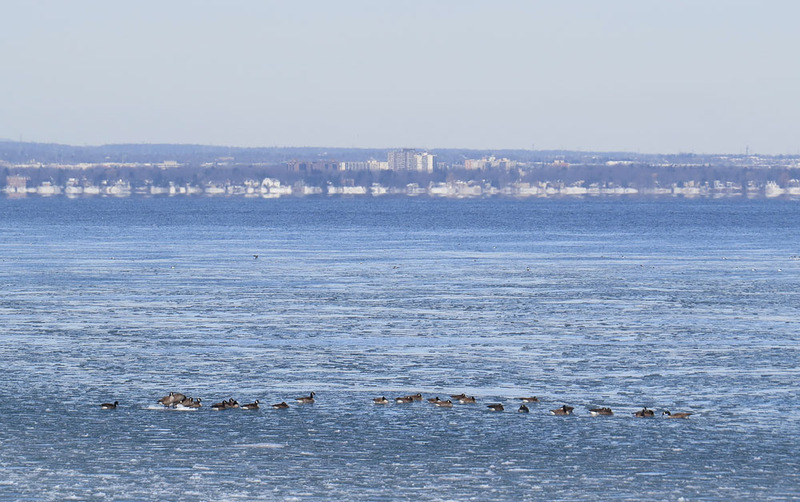 I'm going out on a limb again and say that they still aren't being "frozen out" - and are instead migrating... I think it would explain the lack of body fat. (eg,/ migration uses up their fat stores - then they can't replenish them because they can't find good places to feed with all the ice around). Still - just my 2 cents. 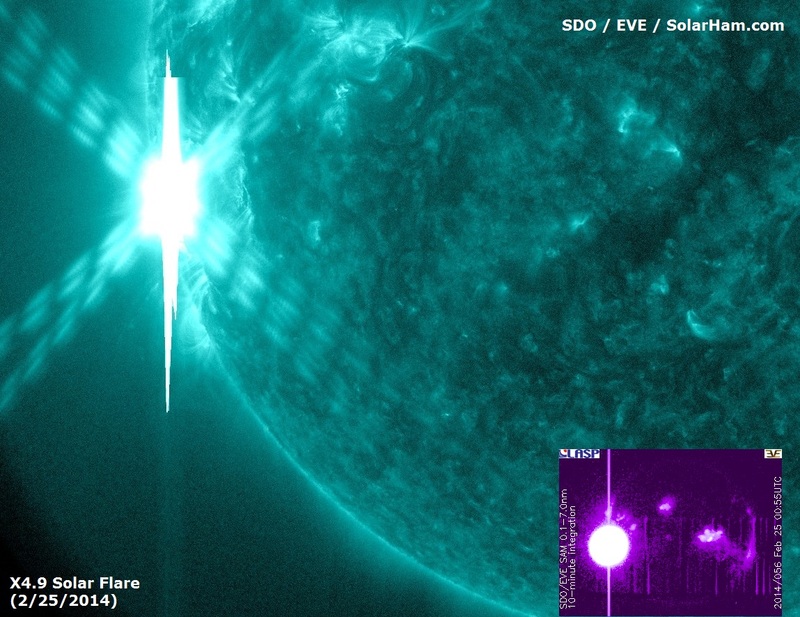 A major solar flare measuring X4.9 was just observed around returning sunspot 1967 (newly numbered 1990) at 00:49 UTC. 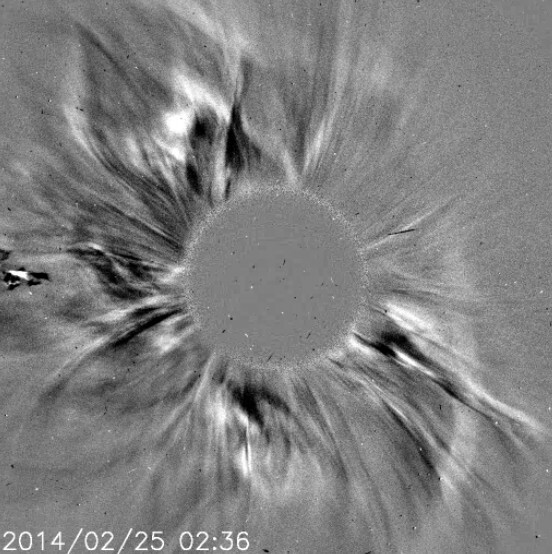 Despite appearing to be in an advanced state of decay, the active region remains magnetically potent. This just proves that you cannot judge a book by its cover. A 10cm radio bust measuring 3700 sfu and lasting 85 minutes was associated with the event. The sunspot is not yet in a good geoeffective position for Earth directed eruptions. The flare is the 3rd largest X-Ray event of the current solar cycle. More updates to follow regarding a possible CME. CME Update: Attached image below by LASCO C2 captures a halo coronal mass ejection (CME) leaving the sun at a quick rate of speed following the X4.9 flare event Monday night. Click HERE for a movie. Because the source sunspot (1990, ex 1967) is still located near the east limb, the plasma cloud is directed mostly away from Earth. Despite this, there does appear to be an Earth directed component which could deliver a glancing blow to our geomagnetic field by mid week. More updates to follow in the days ahead. Doesn't that sound freakin awesome?!?! Why are lifetime memberships so freakin expensive? A little rant post... Not much of a rant though... Facts, and a tiny bit of rant. Looking at OFO memberships recently, I noticed that the annual rate is $35/year... Not bad, given the publications. That's TWENTY YEARS of membership fees before you begin to break even. Twenty years ago I was in grade 1 !!! How do I even know if OFO will be around in twenty years? 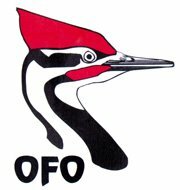 I sort of get it, because the money needs to come from somewhere for OFO news, the website, Ontario birds (publishing AND mailing). But to be honest, beyond that, the website doesn't really do a great job of selling me. Next up - my hometown group - the Hamilton Naturalists Club! $45/year !??!?! What the heck! That's $10 more than OFO - and I don't see any colour journals being published. In fact, I don't see anything on that page (at all) about what my benefits are as a member.. In classic "Ontario Nature" style - they just offer up more ways to give away your money. You thought spring was here, did ya? 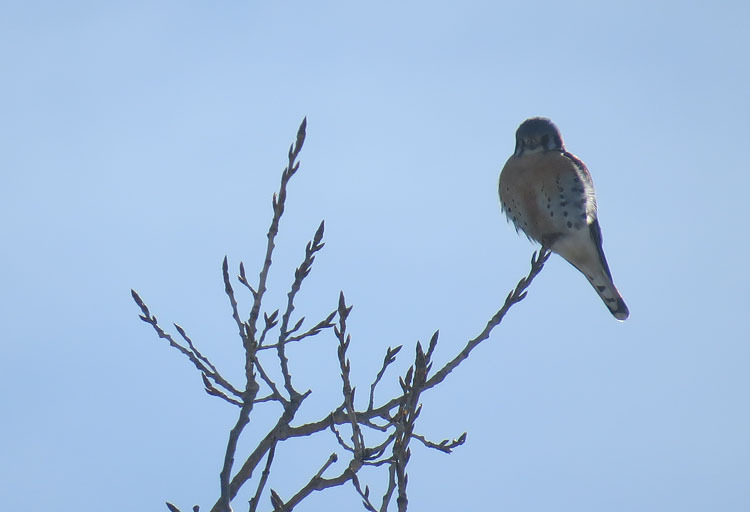 I have no idea who is scheduled to be at Grimsby (Beamer) for the start of the hawkwatch this spring - but the first few days of March are going to be extremely cold... If anyone actually stands out there for the entire day, they deserve to have a Gyrfalcon land on their face. I took a 1.5 day layover in Vancouver back in December so I could get some Chestnut-backed Chickadee photos... The lil buggers turned out to be really tough to photograph, and I ended up with some mediocre results. On the other hand, this Hairy Woodpecker photo was one I was reallly happy with! Haven't done much photo editing this winter... OBRC stuff gets in the way I tell ya! Even in Prince Rupert, the majority were "impure" like this bird... But were they hybrids with Western? Or Herring? Or are they just more variable than people give them credit for? 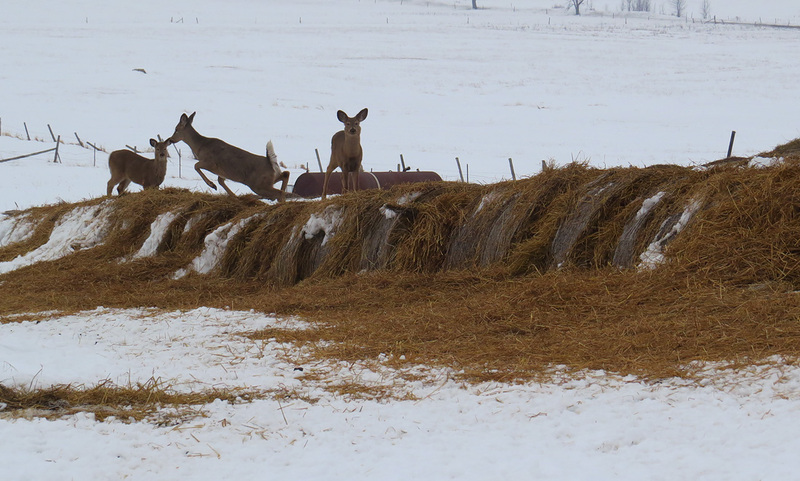 White-tailed Deer recently frozen out of Lake Ontario - crash landing on any available food source. 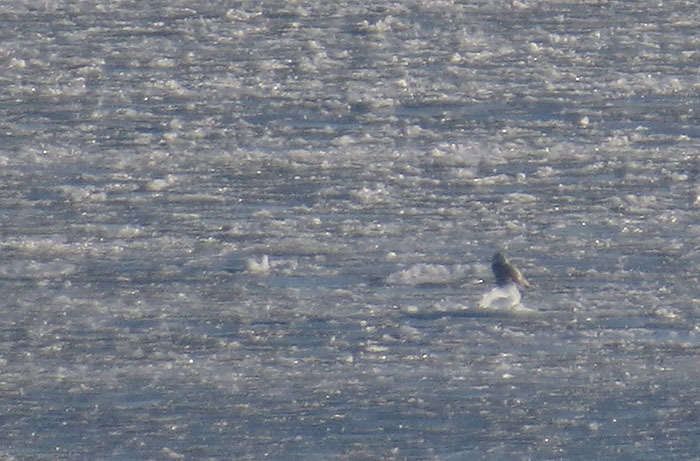 Hopefully this storm (and strong winds) will break up a lot of the ice cover on Lake Ontario to help them return to a normal lifestyle. ebird says there was a KILLDEER near Long Point yesterday! Makes me wonder - is it a true migrant, or an "overshoot" (or "vagrant"?) - either way, it's going to be cold next week! Very exciting weather! Over the next week! Major storm bringing 25 - 50 mm of rain Thursday and Friday. An Alberta clipper and Texas low will be tracking towards the Great Lakes where they will merge and rapidly intensify. This storm system will bring rising temperatures to Southern Ontario along with significant precipitation and strong winds. Rain is expected to begin over Southwestern Ontario near midday Thursday then spread eastward to the Golden Horseshoe Thursday afternoon reaching the Kingston area early Thursday evening. There is a chance that a brief period of snow, freezing rain or ice pellets may precede the rain as temperatures rise from just below freezing to above. Total rainfall amounts of 25 to 50 mm are expected over the warned areas, with the highest amounts forecast to be in the Windsor-Sarnia to Hamilton-Niagara corridor. In addition, thunderstorms will be possible over Southwestern Ontario and the Golden Horseshoe, and may result in locally higher rainfall amounts. Significant snow melt due to the rising temperatures will also be a concern. As the rain comes to an end from west to east Friday, winds will increase out of the southwest with gusts to 70 or 80 km/h possible, particularly along the great lake shores. Meteorologists continue to monitor the development of these weather systems. Please monitor the latest forecasts and warnings from Environment Canada at www.weatheroffice.gc.ca. Snowfall warnings, winter storm watches, and special weather statements for northern Ontario.... Every part of Ontario has some type of statement-warning from this system. Woot! Monster weather event on our hands??? Phasing of the jet stream (and the two lows) into a 976mb utter monstrosity over Lake Superior!!! Storm Prediction Centre of NOAA forecasting a big chance for severe weather due to this event in the USA - most likely from strong winds - and maybe a few Tornadoes! 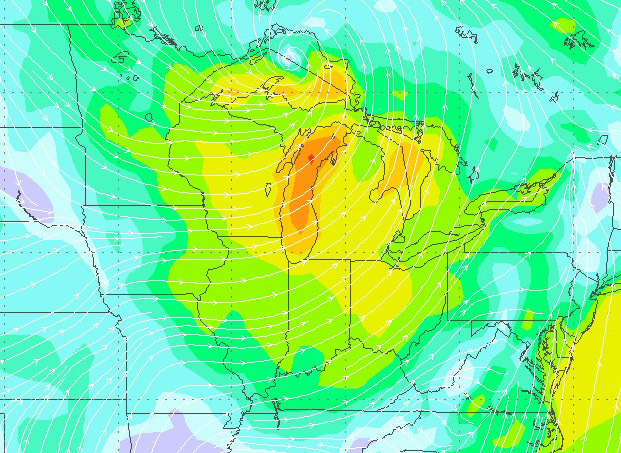 The timing may be off for us to get any diurnal migrants on Friday for southern Ontario... But maybe warm winds overnight will bring some migrants? 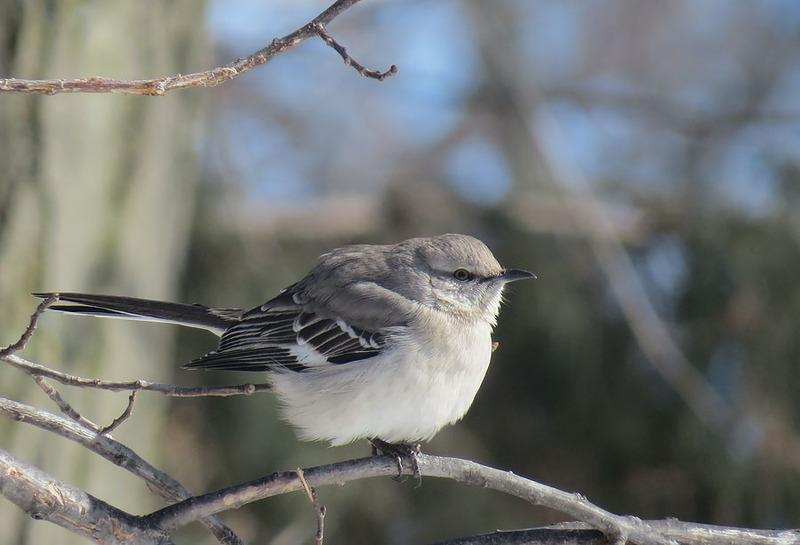 Overall though it looks pretty exciting (for February standards), so I'll be keeping my eyes peeled on ebird and other locations to see what types of birds may move around during this event. This is probably the first true "spring like" storm of 2014 for our area. Con-do! Bir-ding! Up-date! Feb 4 to Feb 17th! With that said, I've still had some random sightings of great birds! Things are picking up! February 13th - still lots of ice!!! A notable increase in gulls this day, and I was really surprised to see an adult LESSER Black-backed Gull... Migration underway with gulls as well, I think! 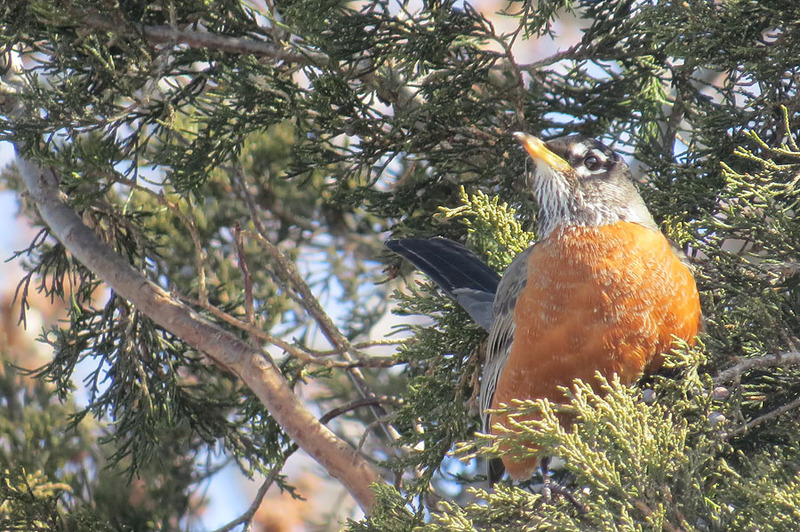 Other good birds were 2 Iceland Gulls, 1 Glaucous Gull, and 1 beauty American Robin on the front lawn of my building when I drove in... (A small group have wintered locally). 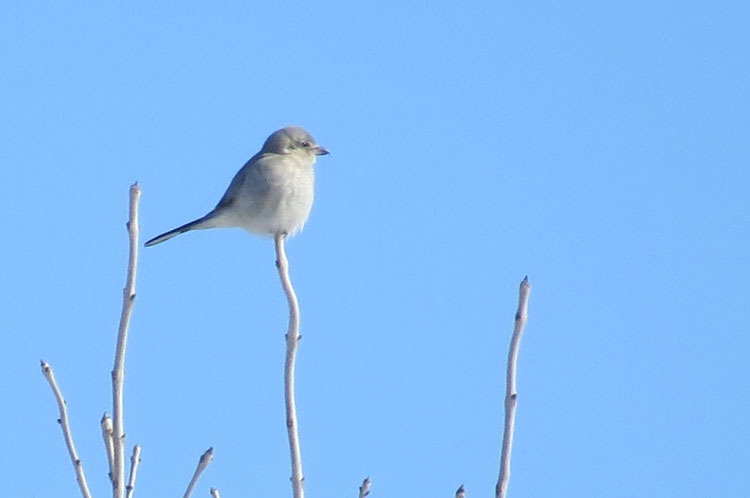 Other good birds were a "patch" Northern Shrike, another Robin, and a flyby Glaucous Gull... In the evening, I had another great highlight in the form of ---- another SNOWY OWL baby!!! A probable "adult" male, giving chase (poorly) to some big flocks of ducks waaay out - as the sun was setting. Glaucous on far left, Iceland on far right. This is a weather blog, right? Lake Superior! How could you!